If you have ever had a wayward pet, you know how hard it may be to learn how to stop a dog from digging. A bit of preparation can go a long way in keeping your yard in order and prevent frustration. 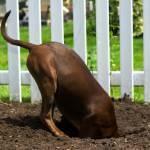 In order to understand how to prevent digging, it is important to know why your pet digs in the first place. Consider these common reasons and review the circumstances in your case to decide which reason is the most likely one. Use the knowledge of your pet to come up with the most suitable solution to your digging issue. Dogs need shelter. If your pet does not have a dog house or some other area to consider his own, he may dig a hole to create one. Temperature fluctuations may cause your dog to dig. This is especially true when the weather is warm because lying in a cool hole is much preferable to sitting in the sun. Hunting is an instinct many breeds have. If the area where your dog is kept has been landscaped with compost, your dog may dig to find the "source" of the smell. This is also true for Terriers and other breeds that were originally used to track small animals, such as rabbits or foxes, into their dens or holes in the ground. Booty such as saved bones or uneaten food may be buried for later consumption. If you see your dog digging repeatedly in the same place, it may be where his cache of extra goodies is hidden. Boredom is a common reason dogs dig. If your pet is left for hours by himself each day, he may try to dig his way out of the fence to find other adventures or friends. Illness often leads dogs to search for a secure place to heal. In the event a dog is nearing death, he may dig to find an isolated place to die. Reproduction is one of the most urgent reasons a dog may dig. For males, the scent of a female in heat can cause them to go to extraordinary measures to escape the yard and reach her. Tackle the most obvious reason your dog is digging. This may seem like an overly simplistic solution, but understanding why your dog is digging is the first step to keeping your yard intact. It may require you to observe the dog for several days without him knowing you are watching. Enroll in an obedience class. This may help you to control the behavior when you catch him in the act. A stern "No" or "Stop" should help your dog understand that digging behavior is not acceptable. For a more concrete solution, you can either install invisible fencing or underground chicken wire. Both can be time consuming and somewhat expensive but should definitely deter your pet from trying to escape the fence. Invisible fencing works by sending a small electric shock to a special collar your dog wears. If the dog tries to cross the "fence line" he will be shocked. Chicken wire buried under the fence line will prevent your dog from being able to dig his way out. If general digging in the yard is the problem, several things can be done. First, find your dog's stash of bones or other treats, dig them up and remove them. Discourage further burying by making sure he completely finishes any bone before allowing him back outside. If the dog is a full time outside dog, monitor his consumption and use the obedience tactics of "No" and "Stop" if you catch him trying to save the bone for later. If your dog only appears to be digging in order to cool off or find shelter, make sure you make sufficient water and shade available at all times. As long as the dog stays cool and feels safe, he should not be driven to dig. Now that you know how to stop a dog from digging, remember to monitor your dog closely for signs the digging may resume. As long as you keep him entertained, exercised and healthy, you should significantly reduce the chance he starts digging again.